This OSHA CAUTION Low Overhead Clearance Sign with text and symbol makes your Clearance & Floor Capacity message clear to employees, visitors - and inspectors. Overhead clearance signs and other OSHA caution signs communicate maximum height and weight requirements to employees and machine operators in your warehouse. 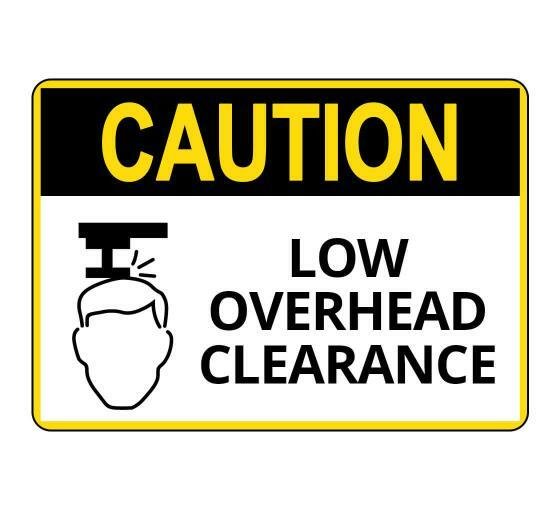 Overhead clearance signs warn employees of areas with low clearance, low pipes, and low headroom. Maximum capacity signs alert workers and truck drivers of the maximum capacity of particular vehicles or in certain areas of the warehouse. Place OSHA caution signs (like clearance and capacity signs) in shipping and receiving areas, basements, and anywhere a low ceiling or weight limit is an issue. BannerBuzz offers a wide variety of other warehouse safety products that will protect your employees from dangerous accidents. Choose from a large selection of clearance, capacity, and other OSHA caution signs that we have in stock. They are ready to ship today.